To celebrate the start or return of many Bryant Park summer programs, and to introduce our readers to our fantastic partners, we asked our partners to write guest blog posts. This post comes from Emily Fletcher of Ziva Meditation. I’m Emily Fletcher of Ziva Meditation. We’re so excited to be at Bryant Park this summer every Tuesday at 11am right after Yoga, to teach some meditation goodness. For those of you who are new to meditation, it’s simply a stress relieving tool. Less stress in your body allows you to perform at the top of your game. And as you improve your performance, you improve your life. The great thing is that yoga was created to prepare the body for meditation, so if you’re planning on taking the Tuesday morning yoga class, stick around after for meditation with us. Emily teaches at her 38th Street studio. I discovered meditation during my ten year career on Broadway, where I thought I was living my dream, but it turned out it wasn’t all sunshine and Liza Minnelli. The first night I started meditating, my insomnia went away. Shortly after my hair stopped going grey, I had more energy, and I was performing better. Eventually I became inspired, took a trip to India, learned to teach this simple yet very powerful practice, and haven’t looked back since. I've trained over 1,000 people in my studio right here in midtown, as well as in Los Angeles and at organizations like Google, Viacom, Harvard Business School, and the Omega Institute, and am very proud to spearhead some of the largest group meditations in Manhattan all summer long. 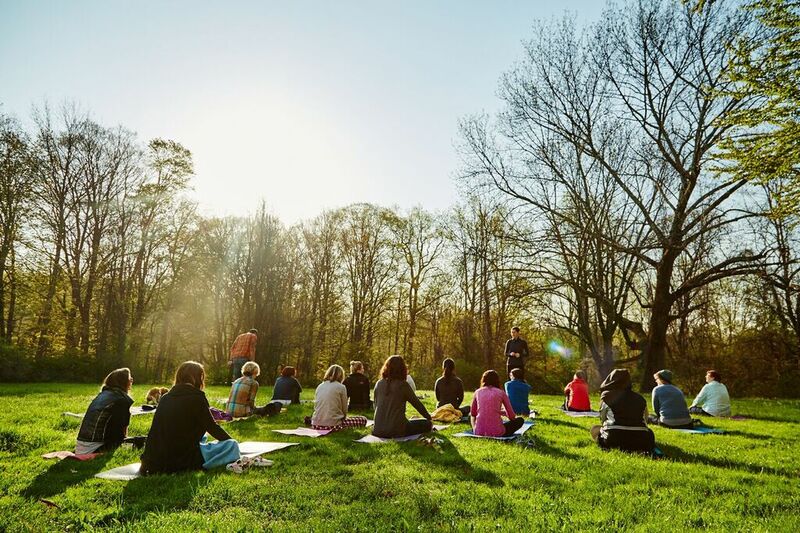 Come join us in the park to learn some great tools that you can take with you into your day to day life, and learn more about meditation and what we do at Ziva. We're online, and we're social! Facebook, Twitter, Instagram, free videos on YouTube and free audios on Soundcloud. See you in the park! A group of meditators find their bliss with Emily.